You can order Simbrinza Opthalmic Solution and other prescription and non-prescription medications through one of the largest online pharmacy provider. 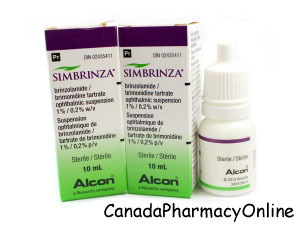 We currently have the brand name Simbrinza from Canada manufactured by Alcon. The generic for this medication is not available. Simbrinza is available in the strength of 1%/0.2%/10ml Opthalmic Solution. Browse through our website CanadaPharmacyOnline.com or call Customer Service at 1866-920-3784 to place an order today. Simbrinza Opthalmic Drops (Brinzolamide/ Brimonidine Tartrate) is a prescription combination medication that is used to decrease pressure inside the eye by reducing the amount of fluid in the eye. This medication is used to treat open-angle glaucoma or ocular hypertension (high pressure inside the eye). Brinzolamide belongs to a class of drugs known as carbonic anhydrase inhibitors. Brimonidine belongs to a class of drugs known as alpha agonists. Simbrinza Opthalmic Drops is not recommended for use in kids that are younger than 2 years of age. You should not take Simbrinza Opthalmic Solution if you are allergic to Brinzolamide or Brimonidine Tartrate. Before you start taking this medication, inform your doctor about your medical condition and about all the medications you are currently taking including OTC and herbal medications. This drug may make you dizzy or drowsy. Do not drive or do any activity that requires you to be alert. Limit alcoholic beverages. It is unknown if this medication passes into breast milk.